Since 2007, we have been a part of Kiva, a non-profit that matches microloan lenders with borrowers who are small business entrepreneurs. The vast majority of Kiva borrowers are from developing countries and the success of their businesses positively affects their local economies and helps to lift them and their families out of poverty. Lenders can lend as little as $25, and as the loan is paid, the lender receives his or her money back and can either take it out or relend it to another borrower. So far, we have helped to fund microloans to 42 entrepreneurs and 33 of them have paid back their loans in full, including two of our 2011 borrowers, Ivanna and Oleg. That has given us enough to start our loans in 2013, and we chose as our first loan of the year Saleh from Jordan. Saleh is 49 years old and has three children. 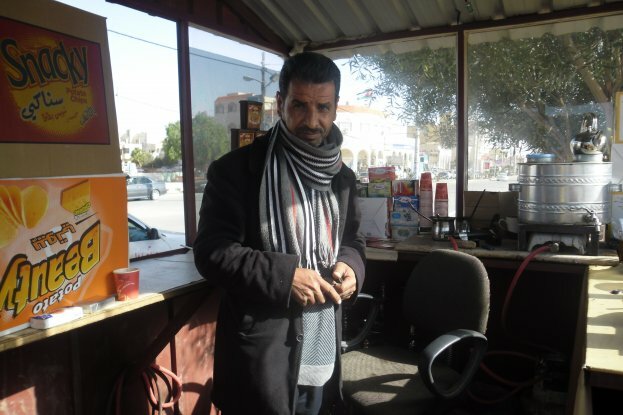 He owns a beverage stand where he sells hot chocolate and coffee, and he requested a loan to start stocking a new kind of coffee to expand his business. Since coffee is one of the mainstays of a B&B, this loan sounded great to us! And since Jordan is a country with stability issues in a region that has stability issues, making it hard for the country’s poor to obtain loans, we like the idea of helping out someone — one person can make a difference (or in Saleh’s case, 78 lenders including us are making a difference). One aspect of lending that we learned about with regard to Jordan is that 80 percent of the economy is made up of small businesses, and many of them are not able to get loans from the country’s banks because of their size. The microfinance institution helps borrowers like Saleh connect with lenders through Kiva so that those borrowers can improve their family’s standard of living. In addition to our participation in the microloan process, Innkeeper Brigette is also a member of the Kiva volunteer team, serving as a Kiva Editor for the past several years. The loans coming from non-English speaking countries are translated into English by the Kiva Translation team, and then the Editing Team takes those loan descriptions and fixes any grammar or sentence structure issues, making them easily readable for lenders. Since January 19, 2013, is the National Day of Service in conjunction with MLK Day on January 21, Brigette will be spending some time editing loans for Kiva, which is based in San Francisco.